So you’re looking down the dog food aisle at your local pet store, and you’re absolutely stumped. Which do you chose? Orijen Dog Food and Blue Buffalo Dog Food seem like the best of the bunch, but if you need to make a choice, we’re here to help by breaking them both down for you. 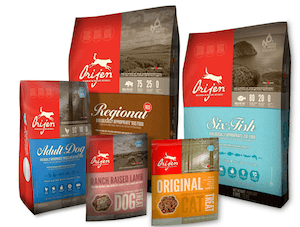 Orijen is, quite simply, one of the best dog food brands out there. Based out of Canada, this dog food company prides itself on providing dogs with the highest possible nutrition, with all-natural ingredients, a higher concentration on meat in their food rather than grain and filler, and a higher level of the kinds of protein and fat your dog needs. 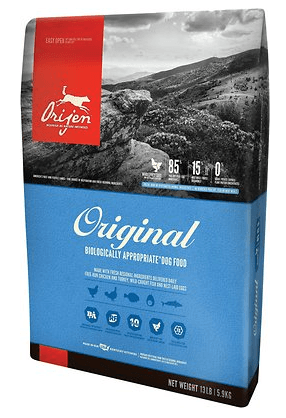 Perhaps one of the most intriguing products Orijen puts out is its Six Fish Fresh Dry Dog Food, which is made of around 70% freshly-caught fish (this being from Canada, I’m inclined to believe them!) – Canadian salmon, lake trout, freshwater cod, herring, northern lake whitefish and walleye, to be precise. This high concentration of fresh fish protein makes their Six Fish combo very high in Omega-3 fatty acids, which is an innovative solution to a gap we’ve found in many dog foods. Luckily, Orijen has a great solution for you! Orijen’s central component in their dog food product development is ensuring the use of all-natural ingredients in their dog food, and by all accounts this promise has been maintained. Orijen’s products maintain a very high concentration of meats and natural vegetables (like chickpeas, lentils, green peas and alfalfa, among others), rather than focusing their products on grains and chicken meal. There is a lot more meat altogether in most of Orijen’s products than other dog foods, which is a huge feather in their cap. 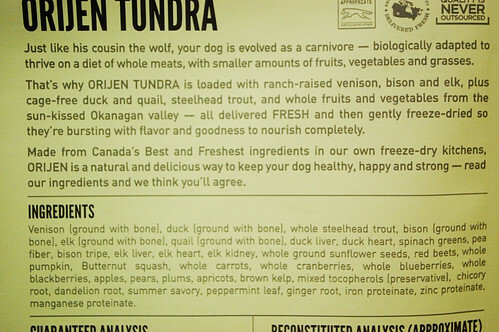 Seriously, even looking at some of the minor ingredients in Orijen’s dog food is likely to impress you. According to Dog Food Advisor, Orijen’s Adult Dog Dry Dog Food formula includes such things as dried alfalfa, which is a material that contains about 18% plant protein and 25% fiber, and selenium yeast, which is a natural yeast supplement that can prevent cancer in a more organic way than the more artificial sodium selenite. If you can stomach paying this much for dog food, Orijen is the product for you. Between its natural pedigree and the high quality of its food, you’ll have to look hard to find a more nutritious product for your pet on the market. However, you might want to look elsewhere to feed your dog in a way that won’t bankrupt you. While Orijen is the cream of the crop, Blue Buffalo Dog Food is another major contender in the world of all-natural healthy dog foods. 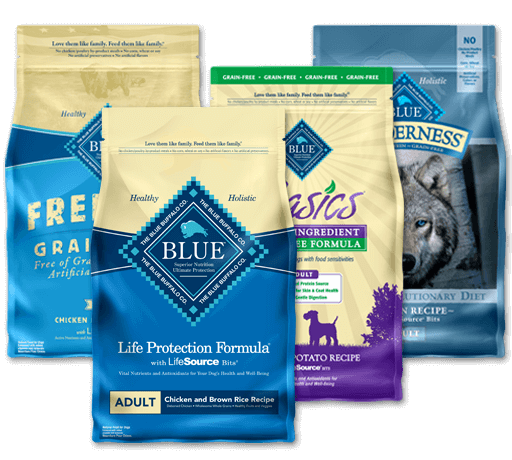 A company that offers both dog and cat foods in a variety of types, Blue Buffalo also works hard to maintain a high-quality nutrition philosophy that emphasizes natural ingredients and holistic nutrition. Given these principles, it’s easy to see just how much it provides competition for Orijen’s already high-quality products. 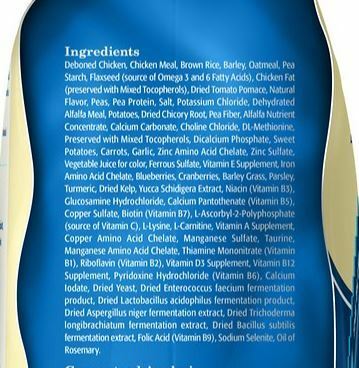 When examining Blue Buffalo’s Blue Wilderness Chicken Large Breed Adult Dry Dog Food, the first thing that comes to mind is the long ingredients list. While that can be a bit scary (especially compared to Orijen’s leaner, more readable list of contents), a closer look shows that Blue Buffalo’s priorities are in the right place. Blue Wilderness chicken contains all nature deboned chicken, bolstered with chicken and turkey meal, peas and tapioca starch, which emphasizes a slightly higher focus on meat content in their dog food than other dog food companies (with the exception of Orijen). Even the non-meat ingredients are high in quality, with peas being a great source of carbohydrates and natural fiber for your dog, and tapioca starch being a gluten-free carb that provides an acceptable filler for the product. It’s not all sunshine and roses, though – there are a few ingredients you might want to watch out for in these particular products. Chief among them is tomato pomace, which Dog Food Advisor warns is controversial for its use as a cheap food filler that, while inoffensive, doesn’t offer as much nutrition as you might like. Blue Buffalo also uses caramel to artificially color its food, though that should not be a significant detriment to the final product. When looking at Blue Buffalo as compared to Orijen, both of them provide substantial benefits. 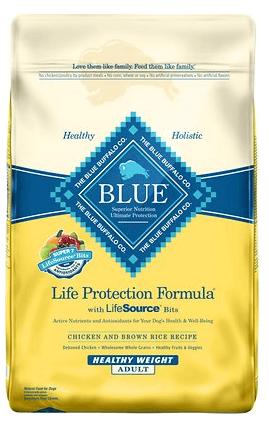 Blue Buffalo uses fewer exotic, highly-sourced ingredients, but its nutritional value is similarly high compared to lower-tier dog foods, and its filler leans further toward the healthy side of things than one might expect. Blue Buffalo’s high nutritional value may be as concentrated as Orijen’s, but it might just be a decent compromise for budget-conscious dog owners wanting the best for their dog within reason. However, Blue Buffalo themselves have had their fair share of controversy, including dangerously high levels of Vitamin D in their products in the past, so tread carefully. Orijen vs Blue Buffalo: What's the Verdict? While Blue Buffalo still has quite a lot to offer, and is probably better than most dog foods out there, it is pretty hard to match the all-natural goodness of Orijen’s high-quality meat-based product. Nothing against Blue Buffalo which is definitely a step up from the Purina’s of the world, but Orijen is in just another league–chicken meal, tapioca starch, rye, and white potatoes among other grains in Blue Buffalo’s top 10 versus almost exclusively whole meats with some vegetables in Orijen’s top 10. Giving Blue Buffalo an A+ rating is more than a little suspect. You guys must have been bought out you are comparing a highly tuned exotic Italian sports car to a honda civic, the verdict? They are both good because they are loud!! !